Chien-Ming Wang's New Documentary Premieres in the U.S.
Chien-Ming Wang during the interview with Giant Robot Media. Every great sports movie shows the road to the big win. But what happens after the glory days? Most athletes retire and go on a golf tour. Others become talk show hosts or open restaurants. Not Chien-Ming Wang (王建民). After a career-ending injury in 2009, Wang was hungry to return and pitch in the majors. His journey was captured by director Frank W. Chen and the documentary, entitled “Late Life: The Chien-Ming Wang Story”, premiered on Thursday, May 9th, 2018 at the Regal Live Theater in downtown Los Angeles alongside the Los Angeles Asian Pacific Film Festival. The screening was accompanied by many who supported Wang’s career, including his family, his agent Alan Chang, and key people in the documentary: Frank W. Chen, cinematographer Hai-Tao Wu and producer Brian Yang. Yang was also the producer for “Linsanity”, another underdog sports documentary about the rise of basketball star Jeremy Lin. For many Chinese and Taiwanese, Wang is a childhood hero. He was the first Taiwanese to be widely seen on ESPN, and he played for the Yankees. In a way, Wang paved the path for people like Jeremy Lin and Tzu-Wei Lin (infielder for the Red Sox). The documentary focuses on Wang’s road to recovery from his injury and also the incredible amounts of training he had to undergo to get back to a 90+ mph pitching arm. More importantly, it was amazing to see just how many coaches, doctors, family members, and friends worked together wholeheartedly just to see Wang back on the mound. The film also expressed Wang’s personal struggle with the public. When an athlete accomplishes something great and they retire, everyone expects them to go away. In fact, when they resurge, people not only question their return, but also attack their decision. Take Michael Jordan. After retiring from the Chicago Bulls, he returned to the NBA as a Wizard. Many critics, and fans, ridiculed his decision, that his return damaged his legacy. But let’s look at the stats after his return. Jordan played all 82 games in his last season of the NBA and averaged 20 points per game. Just to put that in perspective, Lebron James played 82 games this year. James is 33. Jordan was 41 years old. Director Frank W. Chen (left) and Chien-Ming Wang (second to the left) speaking to the audience after the screening. There’s something beyond legacy here. In fact, it’s elementary: it’s purely the love for the game, the love for the craft, and the love for the struggle. The “I did it” mentality is beyond the trophies and the championships. It’s something much simpler than all the pomp and circumstance we give national sports credit for: it’s for that Sandlot moment when hitting a ball or sliding into 1st is more gratifying than anything in the world. For Wang, it was just to throw one last strike-out in the Major Leagues. Chien-Ming Wang walking to the theater with his son. Director Frank W. Chen, Cinematographer Hai-Tao Wu, and Producer Brian Yang follow behind them. 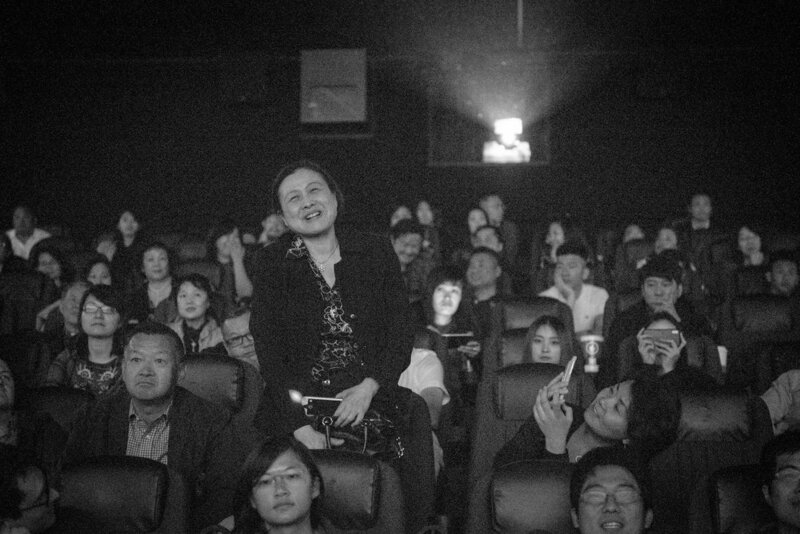 The suprise reaction from the audience as Chien-Ming Wang entered the theater. With that, in 2015, Wang gave Chen the okay to film. At first Wang was uncomfortable in front of the camera. Combined with his modest nature and soft-spoken temper it took a while for him to let loose in front of the lens. But after a few weeks, the camera disappeared and what we see onscreen is the real Chien-Ming Wang. “I was not used to it at all in the beginning. Everyday, when they concluded shooting they would leave, and I would go about my day. As I got to know everyone better, we would go get meals together after the shoot,” says Wang. 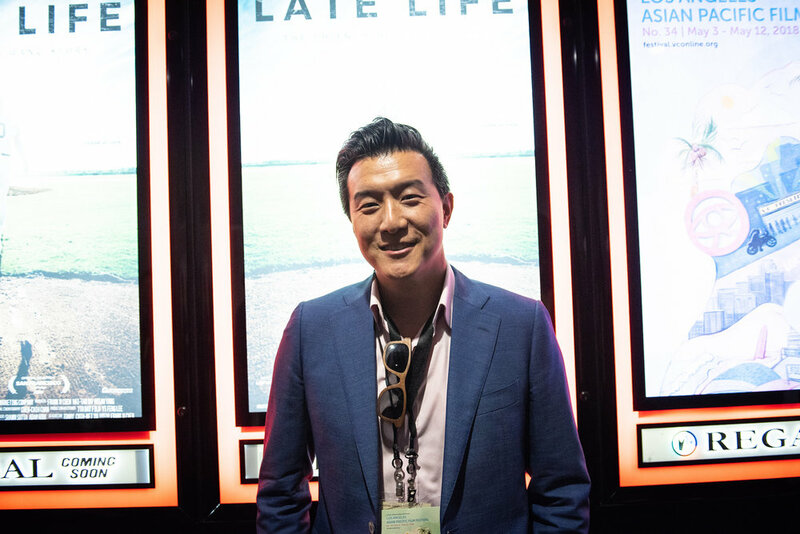 Chien-Ming Wang heads to the premiere of his documentary "Late Life: The Chien-Ming Wang Story." During the post-production phase, Chen shared the film with Brian Yang. After viewing it for the first time, Yang was motivated to help get “Late Life” out into the public. Just before we stepped into the screening, I remember asking Wang how he felt about the screening. For more information on the film, please visit http://www.latelifemovie.com/. Dir. Frank W. Chen (left) with Chien-Ming Wang and his family, and his agent Alan Chang (second to the right) and producer Brian Yang (right). The reception after the premiere in downtown Los Angeles. Fans give Wang flowers after the premiere. A little boy asked Wang about his baseball career. Cinematographer Hai-Tao Wu (left) with Frank W. Chen, and Alan Chang, and Chien-Ming and his family. Dir. Frank W. Chen (left) talking with producer Brian Yang (right) before the premiere. Producer Brian Yang, also known for producing “Linsanity”. Chien-Ming Wang answers questions at the Q&A. A fan from China sharing her gratitude for Wang’s role in major league sports. Before our interview with Wang, we spot him signing posters of the documentary. A young Taiwanese American asks Wang a question about Taiwanese sports.